Allegations of fraud and “dishonourable conduct” now being levelled against the Canadian Hockey League’s 2016 Memorial Cup champion London Knights raise new questions about the authenticity of high-priced sports memorabilia. Scott Galbraith, an avid hockey jersey collector from London, Ont., is claiming, in a civil statement of claim, that he paid nearly $4,000 for a Knights jersey used in a game and was handed a fake. The jersey was advertised to be have been worn last season by first-round Toronto Maple Leaf draftee and 2016 winner of the Ontario Hockey League’s most outstanding player award, Mitchell Marner. The jersey as displayed on the auction site. By “knowingly” passing off a “false letter of authenticity” as authentic and “fabricating a fake game-worn jersey,” the Knights committed “fraud, bad faith, high-handed, disreputable and dishonourable conduct,” reads the statement of claim filed in a London courthouse Tuesday and obtained by the Toronto Star. The $100,000-claim includes $80,000 for aggravated and punitive damages, and, in addition to the London Knights, names the Canadian Hockey League, which hosted the online jersey auction, and the Hockey Hall of Fame, which received a donated jersey from the Knights that Galbraith believes is his. The allegations have not been proven in court and no statements of defence have yet been filed. Trevor Whiffen, governor of the London Knights, said the club honoured its commitment to Galbraith, insisting the sweater was, indeed, worn by Marner during the team’s regular season last year. “We said we’d give him a game-worn sweater. He was given a game-worn sweater,” he said in an interview. When Galbraith complained initially to the team, team officials offered him a refund, Whiffen said. Gene Chiarello, Galbraith’s London lawyer — he was a Knights player, himself, in the 1990s — says the jersey provides compelling evidence to refute the club’s claim of authenticity. In response to a request for an interview, CHL president David Branch referred all questions on the matter to Whiffen. The claim seeks a court order compelling its return to Galbraith. Whiffen said the club took steps to get the jersey back from the Hall of Fame and give it to Galbraith in exchange for a signed confidentiality release, but Galbraith refused to comply. “They want to pursue the right to still sue,” he said. Chiarello said his client should not have to sign a release to obtain an item that is rightfully his. When Galbraith won an online auction for the jersey in May, the Knights had just won the Ontario Hockey League championship and earned entry into the Canadian Hockey League’s Memorial Cup championship series. The CHL is a primary feeder system for the National Hockey League featuring players generally aged 16 to 20. 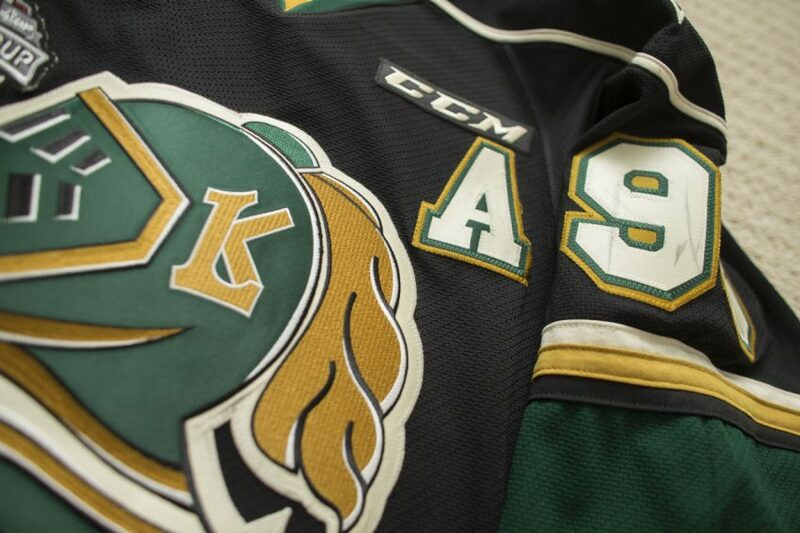 After returning victorious from the Memorial Cup championships in Alberta, the Knights were to provide winners of the jersey auctions with their purchases, the statement of claim reads. When Galbraith contacted the team to collect his jersey, a team official told him the shirt had been loaned to the Hockey Hall of Fame in Toronto, the claim says. After several weeks of unanswered requests, Galbraith received an email from a representative of the team on July 25, the statement claims. Suspicious, Galbraith, who has purchased and sold more than 250 collector hockey jerseys, reviewed high-resolution game photographs of Marner’s jerseys and examined details such as loose threads, stitching and puck markings. He concluded Marner, “wore the same black jersey in the Ontario Hockey League playoffs as he did in the Memorial Cup,” the statement of claim reads. “This was contrary to (the team representative’s)representation that the Marner jersey worn in competition at the Memorial Cup was ‘worn only at the Memorial Cup’ and not before,” the statement reads. In an interview, Galbraith said he was also suspicious because of the long delay from the club in responding to his request for the jersey. “They found the jersey when I said was going to contact a lawyer, which was another red flag,” Galbraith said in an interview. The Knights’ Whiffen says the delay happened because the team was in the process of firing its merchandise manager at that time. Despite his suspicions, Galbraith showed up at the Knights’ merchandise store to collect the jersey offered. The civil claim details a series of alleged inconsistencies between that jersey and those worn by Marner on the ice. A stray thread that appears in high-resolution photos of the jersey Marner was wearing in both the playoffs and the Memorial Cup was missing on the jersey Galbraith was given by the Knights. And the “fighting strap” — used to prevent the jersey from being removed during a fight — on the rear interior of the jersey Galbraith was given had apparently never been used. The Knights’ Whiffen dismissed those allegations, saying team jerseys are not laundered after every game, a single player can wear many jerseys over the course of a season or playoffs and efforts to match jerseys to photos is not a reliable method of proving authenticity. Chiarello, who is going up against his old team by representing Galbraith, calls this his way of representing the same fans who supported him as a player. While the financial returns of CHL teams are not public, the London Knights are widely considered to be one of the most valuable and lucrative clubs in the Canadian Hockey League. Marner, whose agent did not respond to interview requests for this story, logged the most points in the Ontario Hockey League in the 2015-16 season, with 116 points in 57 games. He was honoured with the Ontario Hockey League’s Red Tilson Trophy as the most outstanding player of the year, as well as the Stafford Smythe Memorial Trophy, as the MVP of the Memorial Cup Tournament. “I really like the way he played,” said Galbraith, a fan of the team since childhood, who has been keeping his eye on Marner’s jersey all season with the intention of purchasing it. It’s a habit that consumes much of his life, he says. Scott Galbraith, an avid hockey jersey collector, claims in a civil suit, that he paid nearly $4,000 for a London Knights jersey used in a game and was handed a fake. The Knights deny it.